Thema is a subject classification schema for books, similar to BIC and BISAC, but with a focus on global applicability. Where BIC and BISAC have historically focused on the UK and North America markets respectively, Thema is extendable to allow classification of particular interest to all countries and communities. This article does not attempt to give a complete coverage of the benefits, use and development of Thema. The Editeur website should be consulted for more detailed information. In common with BIC, BISAC, and other subject classification schemas, Thema is divided into two broad areas – subject categories, itself comprising around twenty subject areas such as The Arts , Fiction , Society and Social Studies , and a set of six qualifier lists that provide further context to the content. Although Fiction is only one of many subject categories, which may give the impression that it is poorly served, many qualifier codes also have a direct applicability to works of fiction. By carefully choosing subjects and qualifiers you can be very effective in providing a more nuanced description of the work. For example, you might specify FJM: War & combat fiction and FXP Narrative theme: Politics in association with geographical and time qualifiers of 1DTA: Russia and 1QBCS: Ottoman Empire , and 3MLBJ: c 1730 to c 1739 , to build quite a complete picture of the subject, theme and setting of a work of fiction. The subject categories refer to the content, and the qualifiers help to provide context. Note that the interest age & special interest qualifier codes are separated into two sections in Consonance, for better compatibility with other subject classification schemes. The geography qualifier is much improved over other schemes, as it particularly benefits from national extensions . These allow Thema to be extended with country-specific codes to suit local markets, which are optional in others. For an example, see the comparison later on with the BIC scheme for Egypt . Note that the geography qualifier can effectively include geographical features in more than one code. Geographical areas can be grouped in a different ways. In common with other schemes, this refers to language as a subject of the book, not in reference to the language in which it is written. Note the inclusion of regional and historical varieties of language, with English having a number of more detailed entires available. Also, note that searching for a language name may not reveal the complete set of more detailed entries. In case of doubt, use the language’s code value. The time period qualifier again benefits from national extensions, in that named time periods of local interest are included. These are more easily found with a search for a country code, taking advantage of the code format which separates national extensions with a hyphen. Educational purpose has national extensions also. One important aspect of the use of Thema codes is that the specification of multiple codes from the same direct hierarchy is generally not necessary. Because of the hierarchical nature of the codes, it is not necessary to use ‘high-level’ codes in conjunction with lower level codes denoting specific subjects. With the specific Category QDHR3 ‘Pragmatism’ for example, it is not usually appropriate to add all or any of the preceding codes QDHR, QDH, QD or indeed Q. The fact that the subject is an aspect of QD ‘Philosophy’ is implicit in the QDHR3 code. Similarly, if assigning Geographical Qualifier 1HFGA ‘Ethiopia’, it is not appropriate to assign also 1H to indicate that country is in Africa, and so on. On the other hand, if the book is about modern philosophy as a whole, with a chapter on Pragmatism, another on Phenomenology and a third on Positivism, etc, the correct code to apply would be the broader QDHR, not QDHR3 and QDHR5 and QDHR7. As well as having a necessarily brief text description (provided in a growing number of languages) which cannot always be precisely interpreted, codes are often accompanied by usage notes that suggest, or require, the use of other subject codes as well or instead of them, and which also suggest or require the use of particular qualifier types. It is difficult to be effective in specifying Thema codes if these notes are not considered, and hence Consonance goes to some effort to show these notes to users. For example, JBCC2: Material culture has a note _Class here: role of artefacts & objects in society_ . However, its great-grandparent code JB: Society & culture: general has a note _Use JB* codes for both general & academic works on social topics; use with JH* codes for sociology textbooks & other specialist works as appropriate See also: VFV*_ , which also provides useful information (JH* codes being Sociology & anthropology , noted as …for textbooks or academic & specialist works … ). So to summarise, JBCC2 can be used for both general and academic works on social topics, but if the work is a textbook or specialist work then use a code from the JH range in addition. VFV, by the way, is Family & relationships: advice & issues , and is suggested as being of interest because of a common overlap between the subject areas. 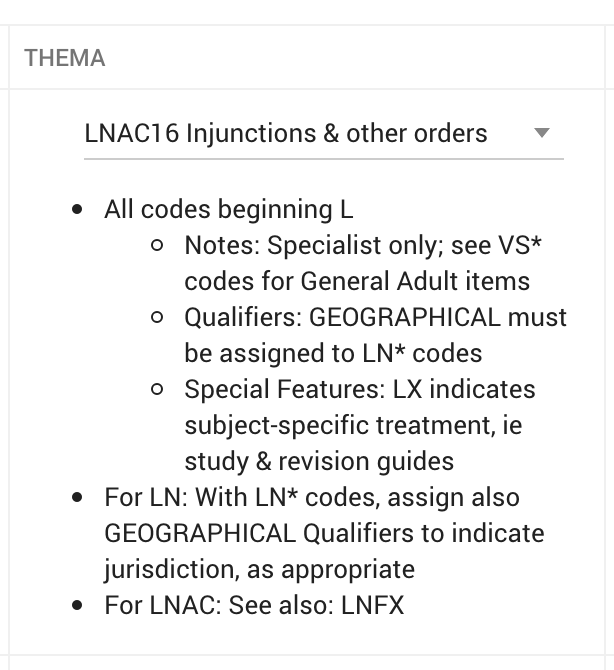 As an example of the suggested use of qualifiers, consider the series of subject codes under LN: Laws of specific jurisdictions & specific areas of law . 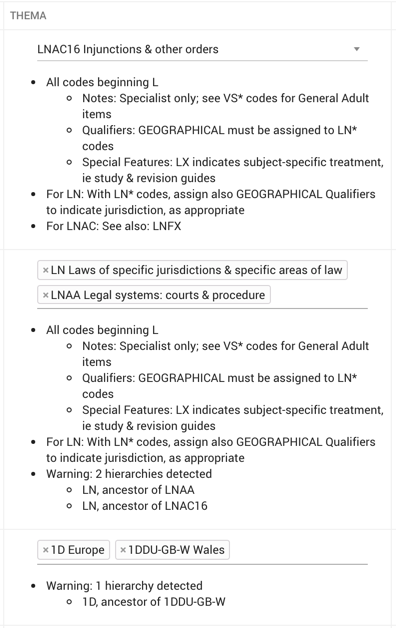 As the name suggests, a work on such a topic might well have applicability only to particular geographical areas, and hence the notes against LN are _With LN* codes, assign also GEOGRAPHICAL Qualifiers to indicate jurisdiction, as appropriate_ . Geographical qualifiers should then be chosen at an appropriate level of detail, which might be as broad as 1KBB: United States of America, USA , or more specifically 1KBB-US-WPNW: Washington (US State) . Thema codes are specified as part of the work metadata alongside, and in a similar way to, BIC and BISAC codes. For each of these, choose a single primary code and multiple other codes. The implementation of Thema codes is more advanced than that of BIC or BISAC codes, as it also includes the display of notes and special features for codes that you chose. Furthermore, if the system detects the presence of hierarchies in the specified codes, it will identify them for you with a warning. Note also that not all codes in the lists are available in Consonance. High level codes with no intrinsic value, for example the two-letter style qualifiers that act as an index for the first letters of the three-letter codes, are omitted. At a casual glance, the Thema and BIC standards appear to be very closely related, and indeed the Thema standard builds on earlier work to make BIC more relevant to international audiences. However, note that while many BIC codes have an equivalent in the Thema standard, the code itself is in many cases slightly different for the same subject. In the example below, we see that for each of the original BIC codes chosen for this book there is an equivalent Thema code. 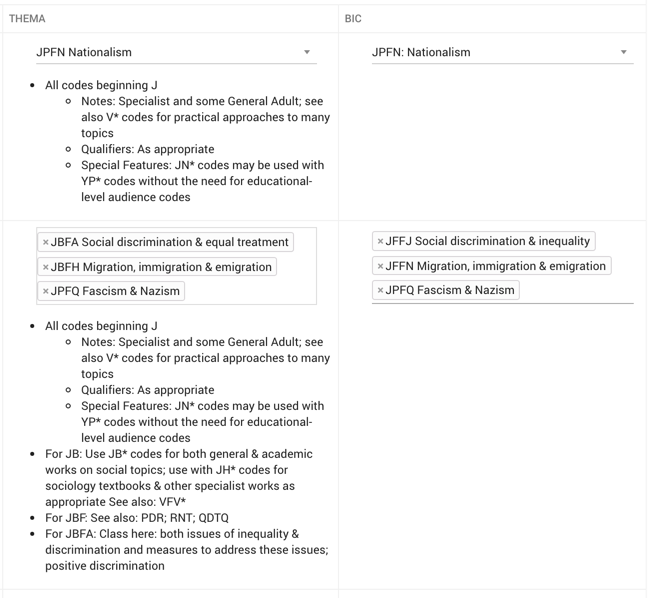 For JPFN and JPFQ there is an exact equivalent, while for JFFJ and JFFN the codes themselves have changed to JBFA and JBFH respectively. Sometimes the reverse is true: the code stays the same, and the description is changed. For example, while BIC 2.1 contains the code KJMV9: Distribution and warehousing management , the equivalent in Thema would be KJMV9 Distribution & logistics management . If you do not find a match based on the code text, search instead for the code. The Thema standard also offers a better level of detail, perhaps most notably in the geographical qualifier. The first search exposes only the subset of the geographical qualifiers that contained the text Egypt , whereas the second showed the full set of descendants of the Egypt code. In contrast, the BIC 2.1 standard contains only two entries more detailed than 1HBE: Egypt . Bear in mind the guidance above for Hierarchies also: if you specify 1HBE-AA-S: Sinai Peninsula , it is not then necessary to specify 1HBE: Egypt also. Search for the equivalent code by text, not by the code value. If you do not find an equivalent, search by the code value. If neither the code nor the text can be found in Thema, use more generic terms to start the search and then use any codes found to drill-down to the most appropriate level of detail. Having found the code for the equivalent subject, search by that code value to detect and explore any more detailed subject codes or qualifiers. An incorrect code choice, for example the use of a code intended for specialist academic interest rather than a general audience. Other areas of the subject scheme which should also be considered. The suggested or compulsory use of qualifiers. If you then correct or augment the Thema codes, consider any useful modifications that can be made to your BIC coding. Remember that Thema is not intended as an immediate replacement for BIC. The main reference for the use of Thema codes should be Editeur’s website. The interactive and multilingual subject browser. Thema: A history and overview (pdf). The complete Thema 1.1 code list (pdf). BIC also run courses on the use of Thema, which we would encourage all clients to consider attending.